Alex Romo holds her son Lonnie during the toddler's appointment with Dr. Van Ramshorst. There are neighborhoods in San Antonio where a high percentage of children are testing positive for lead poisoning. Lead was eliminated from paint and gasoline decades ago, but the toxic element continues to turn up in blood tests of children. At the Robert B. Green pediatric clinic in downtown San Antonio, two-year old Lonnie Romo is here for his check-up. The visit includes finding out if he has lead in his blood. Dr. Ryan Van Ramshorst asks Lonnie’s parents some routine questions. "Does he put things in his mouth like soil or clay?" Contaminated dirt around a house can be a source of lead poisoning. The Romos live in a brand new apartment, so it’s unlikely that old lead-based paint could be a problem. To be certain lead isn’t in Lonnie’s system, the doctor orders a blood test. "It’ll be a blood test, and I think we’ll do it today, if you guys don’t mind," he says. The test means a vein blood draw – and that can get loud. Lonnie’s parents try to soothe him during the ordeal. It’s something that everyone in the room would have liked to skip, but checking for lead exposure is critically important. 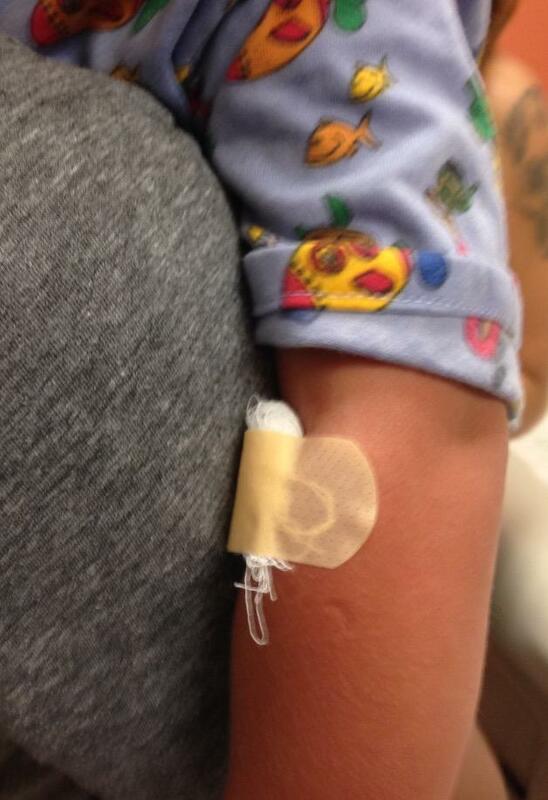 Lonnie Romo's bandage after blood was drawn for a lead level test. Texas does not mandate all children get a lead blood test but 11 other states and the District of Columbia do. Some other states require tests for children who live in high-risk areas. In Texas, outside of the Medicaid mandate, lead testing is basically up to the doctor. “At our clinic here – we screen everybody,” he says. At five micrograms children begin to show diminished IQ, aggression, hyperactivity and behavior disorders. Dr. Van Ramshorst says that’s why routine testing for lead poisoning is such a serious issue. “There is no safe lead level for children," he says. “It is absolutely a public health issue for children,” says Colleen Bridger, director of the San Antonio Metropolitan Health District. “Looking at elevated blood lead levels is one of the things that we do to make sure that our children aren’t adversely affected." Bridger says dealing with the legacy of lead in our man-made environment is an ongoing problem that mainly affects certain areas – older neighborhoods with homes built before 1978, when lead-based paint was banned. Despite the known health threats of lead poisoning in children, it remains unknown how big of a problem lead is on national and local levels. The best way to monitor whether there’s a lead problem in San Antonio is to look at the levels of the thousands of children like Lonnie, who were tested. Results of lead tests are required to be sent to the Texas Department of State Health Services and categorized by zip codes. After filing a Texas open records request, Texas Public Radio was able obtain the data and discovered that there are a number of zip codes in San Antonio that show a percent of children testing positive for lead poisoning at levels much higher than the national and state average. The national average for children who test at five and higher micrograms per deciliter of blood is 2.5 percent. The average in Texas is 2.6 percent. In San Antonio, there were 17 zip codes that surpassed the state average in 2016. Two zip codes were at 11 percent: 78203 and 78212. The former stretches from just east of the Alamodome downtown to the Pittman Sullivan Park area and over to St. Philip's College. The latter covers north of near downtown and includes the Alta Vista, Tobin Hill and Norhmoor neighborhoods. What kind of snapshot does this data give of a lead problem in San Antonio? MetroHealth Director Colleen Bridger says we need to keep in mind that the data set is based on only the children who are tested and that they are a high-risk group. “How do we know if 28 kids tested is a lot of kids or not a lot of kids?" she asks. That being noted, Bridger says it’s clear more needs to be done. “We need to get more parents asking for their children’s blood lead to be tested. We need to get more parents to agree to participate in the environmental assessment that can identify the source of lead,“ she says. And more pediatricians need to be willing to ask for more lead blood test – especially if that child lives in a high risk zip code. Metro Health is offering free vaccines this summer to 11 and 12-year-olds participating in the Parks and Recreation Summer Youth Program. The new director of the San Antonio Metropolitan Health District, Dr. Colleen Bridger, is a nationally recognized speaker, trainer and innovations expert with over 20 years of experience in community development and improvement. 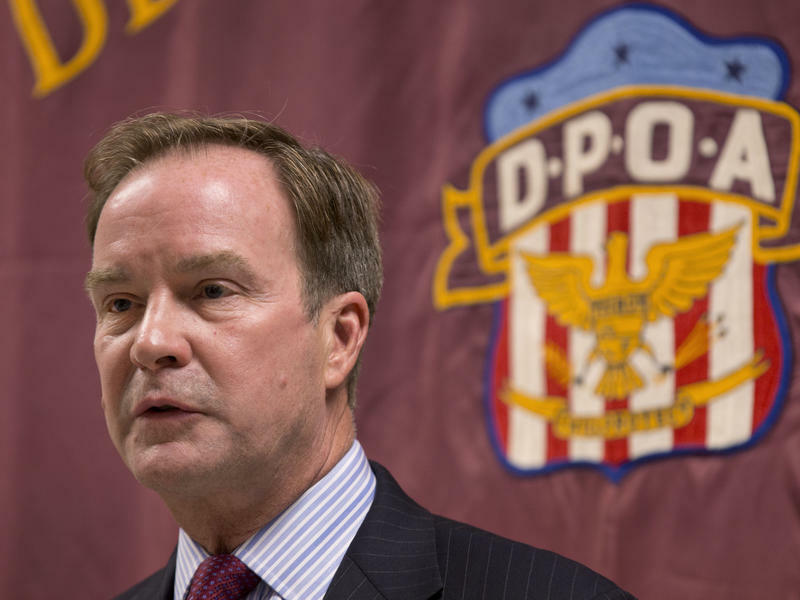 Three people — two officials with the state Department of Environmental Quality and a water official from Flint — are facing criminal charges as a result of an investigation into the lead-contaminated water case in Flint. The three men face felony charges including misconduct, neglect of duty and conspiracy to tamper with evidence. They've also been charged with violating Michigan's Safe Drinking Water Act.